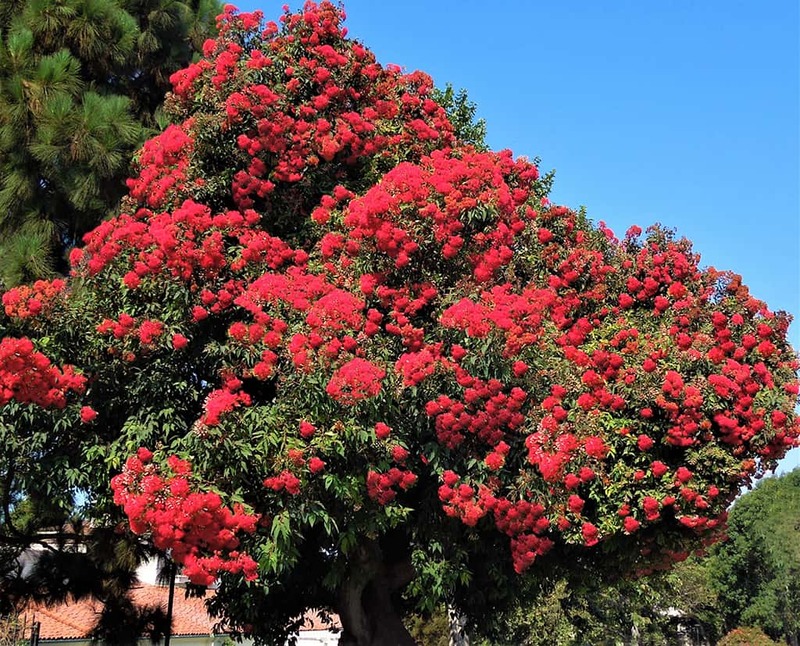 When Santa Barbara decorates for Fiesta every August, the Red-flowering Eucalyptus (also known as the Red-flowering Gum) participates by putting on a spectacular display of vibrantly colored flowers. Some bear bright red flowers, while others bear flowers in shades of either pale cream, pale pink, orange, or deep crimson. No other tree has naturally such a diverse flower color palette – “Red-flowering” is a slight misnomer! While most Red-flowering Eucalyptus bloom primarily in the summer, some will bloom sporadically throughout the year. Flat-topped flower clusters (called corymbs) are located at the ends of the branchlets, typically with 7 blooms per cluster. The flowers’ bright color and sweet nectar are an irresistible treat for bees. When pollinated, the flowers transform into woody urn-shaped seed pods which are relatively large, measuring up to 1 ½ inches long and over 1 inch wide. Trees which have flowered profusely may have such a heavy load of resulting seed pods that their branches can break from the weight. It’s a good idea to prune out the excess pods, particularly on heavy limbs, to lighten the overall burden.Don’t throw them away – both the flower clusters and the seed pods are beautiful in floral arrangements! From a distance, this tree really doesn’t look like a Eucalyptus at all. Instead, it wears a crown that is broad and dense, carries somewhat pendulous branches, and presents slightly-glossy leaves that are dark green above and pale green below (3 to 6 inches long; 1 to 2 inches wide). Its bark is rough, fibrous, and fissured, can be red-brown, black-brown, or grey-brown in color, and does not shed (as some Eucalyptus do). Moreover, it stays rather small, with an ultimate height of 25 to 35 feet and an equal spread. It is relatively slow growing. “Eucalyptus” is another misnomer for this tree. Historically, it had been placed in the genus Eucalyptus. In 1995, after its genome was analyzed, it was moved to the genus Corymbia. Consequently, its current botanical name is Corymbia ficifolia. 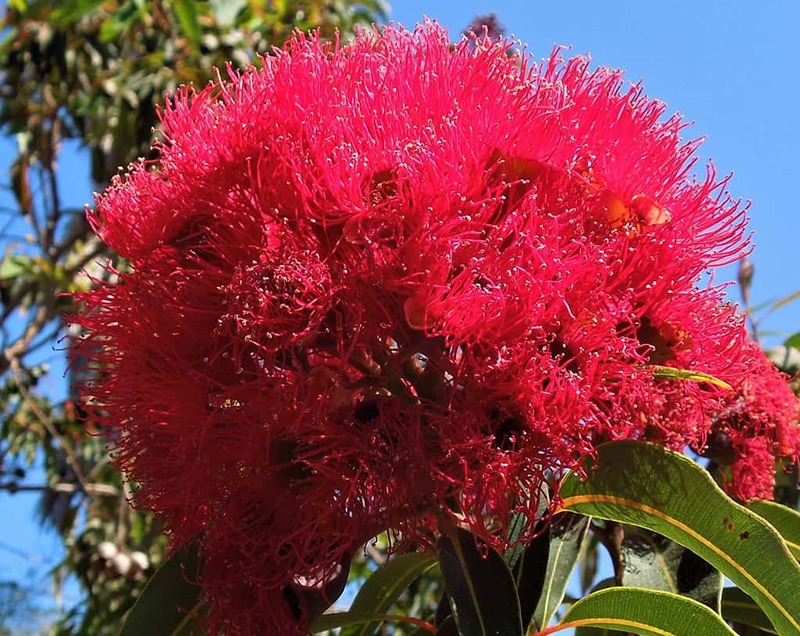 Corymbia refers to its corymb-shaped flower clusters; ficifolia is Latin and means “fig-like leaves” (referring to the leaf shape of the genus Ficus – not to the leaf shape of real fig trees). Red-flowered Eucalyptus has been planted in Santa Barbara since 1900 and is now seen all over town. It is well suited to our climate, since it does best within a few miles of the ocean and is very drought tolerant. It is frost-hardy to about 25 degrees. Mature trees are found as street trees in the 1200-1900 blocks of Chino Street, the 100-800 blocks of West Pedregosa Street, the 100-400 blocks of West Haley Street, the 300-400 blocks of West Ortega Street, the 700 block of West Carrillo Street, and (intermittently) along Cliff Drive, and also stand as landscape trees in Alice Keck Park Memorial Gardens (adjacent to Garden Street).